Recover taxes owing your clients from prior years. It is everyone’s legal right to arrange affairs within the framework of the law to pay the least income taxes possible–especially if cash flow is tight. Lots of people put off filing their returns because they think they may owe money, but in fact, the tax department may owe them (Always nice when that happens!). Tax refunds resulting from errors and omissions may be recovered over a ten year period; so if you’re a delinquent filer or you missed an important tax saving provision be sure to adjust your tax returns by December 31. After this the 2001 tax return is statute-barred. Remember, by filing a return you can also create unused RRSP contribution room, and capital loss carry forward or carry back opportunities. Don’t overpay your quarterly installments: If you have a quarterly tax installment due on December 15, or in the case of farmers, December 31, and you haven’t yet paid it, be sure to calculate your estimated income the current tax year first. If your income will be lower than in past years, you may be able to reduce that payment, or not make it at all. To use the optional “current year” or “prior year” methods of calculating your installments, check out the CRA–Canada Revenue Agency’s publication P110 Paying Your Income Taxes by Installment. This is also a nice way to create new capital for investment purposes, or, that much needed vacation! Compute your family RRSP Advantage: Most Canadians do not maximize their opportunity to contribute to an RRSP—and that’s a shame. It can truly save you a lot of money if you do, yet the time to plan to put the money aside is now. To be most effective it should be made earlier rather than later according to your available RRSP room. The RRSP deduction reduces net income — that line on the tax return upon which refundable and non-refundable tax credits are based. A reduced net income increases those credits and therefore cash flow, leaving more money for investment opportunities. Planning now to contribute to an RRSP for each family member who has RRSP Contribution Room (check last year’s Notice of Assessment for this figure) is smart: it can affect family net income and increase tax credits and deductions that are transferrable. The RRSP makes a great Christmas present too: and helps couples split retirement income later under a spousal plan. Also, if cash flow is scarce, consider which assets held in non-registered accounts could be flipped into an RRSP. Talk to your tax and financial advisors about that to superficial loss rules. Consider tax loss selling activity. Year end is a good time to consider selling portfolio losers to offset winners. Capital losses generated by the sale or transfer of stocks and bonds in a non-registered portfolio before year-end will first offset other capital gains incurred this year. Unused losses can be carried back to offset capital gains you reported in any of the previous three years — a great way to reach back and recover taxes previously paid. Or, you can carry unused capital losses forward, indefinitely — an important way to manage taxes on your next winning investments. Split income and transfer assets. The current low interest rate environment is opportune if you wish to borrow money to increase your portfolio or split income with family members. In the former instance, interest on your investment loan will be tax deductible, provided your assets generate a reasonable expectation of income from property in the future, i.e., interest, dividends, rents or royalties. (Note: capital appreciation is not considered income from property.) For family income splitting purposes, draw up a bona fide loan with your lower earning spouse and charge the prescribed interest rate, to enable the reporting of investment income in that person’s hands. The interest, however, must actually be paid to you by January 30 following each taxation year and you must, of course, report it on your tax return. The TFSA is a must. Give your adult children a valuable Christmas gift: open a Tax Free Savings Account and make sure you and/or they maximize the opportunity to invest up to $5000 in it each year. The earnings will be tax free and the opportunity to use this valuable savings room will build family millionaires—when you consider the annual opportunity. Donate Securities. Capital gains can be avoided entirely when qualifying securities with accrued gains are transferred to a family’s favorite charity before year end. In addition, a receipt for the donation will offset taxes payable. That’s a win-win, and worth a portfolio review in the last three months of the year. It’s Your Money. Your Life. A tax-wise investor becomes wealthier over the long run, no matter the current economic cycle. Most people leave tax savings on the table. Maximize your potential to reduce your after-tax income in the last quarter of this year! 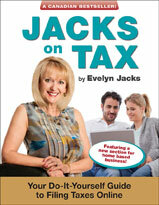 Evelyn Jacks, a best-selling Canadian author of 48 books including the new Essential Tax Facts 2012 and the Founder and President of The Knowledge Bureau, a national educational institute focused on Real Wealth Management™. Learn tax preparation and tax efficient retirement income planning: see www.knowledgebureau.com. I have been blogging about how individuals and businesses can work hard to reduce debt. At a macro level, that may be at the expense of spending to stimulate Canada’s economic activities in the short term, but it may well be a very good plan for shoring up your personal financial stability over the longer term. Without a focus on more aggressive savings, it’s possible that your continued debt, rather than your wealth, will sadly become the legacy of your retirement. Getting your financial house in order sooner, rather than later, will help you build new “redundant income” with which to save in a variety of tax efficient investments including your RRSP or TFSA. Savvy debt management will also help you get ready to protect your savings from two additional wealth eroders you may have to slay in the future: taxes and inflation. You may be aware that governments’ biggest source of revenue is taxes on personal income. If governments are to continue spending to stimulate the economy in the short term, and future if sluggish economic activity expected over the next little while further reduces those tax revenues, an important recourse is raising taxes to meet the demands for government services. That potential scenario puts all the more emphasis on the need for your to manage your personal finances with tax savvy. To minimize personal income taxes in your future, begin your tax recovery plan and create new resources for savings by knowing your marginal tax rate on every source of income you or your investments will generate in the future. You can then tweak your income and cash flow plan with tax efficiency. It’s also important to take a family approach and employ income splitting techniques wherever you can. When you split and diversify your sources of income, you will pay less. Finally don’t forget the ideal order of investing. . .what should come first: your RRSP, your TFSA, an RESP, etc? It’s Your Money. Your Life. It’s the tax savvy steps you can take now that can help you build real sustainable wealth. Speak to your tax advisors soon about creating new strategies to “average down your taxes” with income diversification, income splitting and the deferral of taxes on your investing activities. We have recently been told that the Federal Government anticipates that the result of a more prolonged economic slow down is a reduction of anticipated tax revenues. This will delay deficit reduction by at least a year to 2016. If you were born in 1951, that’s the year you turn 65. All of this scares already-spooked individuals, who are trying to build up their savings and reduce their debt after the financial crisis. But in particular the plentiful boomer generation, many of whom are already delaying their retirements by an extra year or two, must weigh the serious effects of continued poor investment returns on their future. It is a vicious circle—debt, debt repayment, poor returns, fewer services–yet, the outlook is may not be so grim. We may in fact be moving from critical to stable condition. Where in this is there reason for cautious optimism? If recognizing the problem is the first step, then we are well on the road to financial recovery, despite the recent sharp decline in economic activity throughout the G-7 nations. In Canada, labor markets have performed well and private credit remains strong, while the economy is projected to grow by just under 2% in 2012. Domestic demand, though weaker than anticipated in 2011, continues to be a catalyst for growth. The biggest threat, according to the International Monetary Fund (IMF), is that Canadians need to be vigilant on the housing front, given the level of household debt in Canada. Domestic consumption could slow more, if there is a drop in housing prices, and so paying down that mortgage is important. There are numerous ways to do so. Consider making an RRSP contribution to generate new tax savings with which to then pay down your mortgage. Consolidate your consumer debt, and reduce expensive credit card fees. Use your savings to bump up mortgage payments. Take the money from your TFSA to reduce your mortgage upon renewal. Or, take advantage of the strong housing market today to downsize. It’s Your Money. Your Life. It may be a good idea to discuss your options for managing your mortgage debt now before the end of the year so you can start 2012 with greater financial stability.